Hey everybody, this month, I was asked to be the guest artist for The Mixed Media Monthly Challenge. 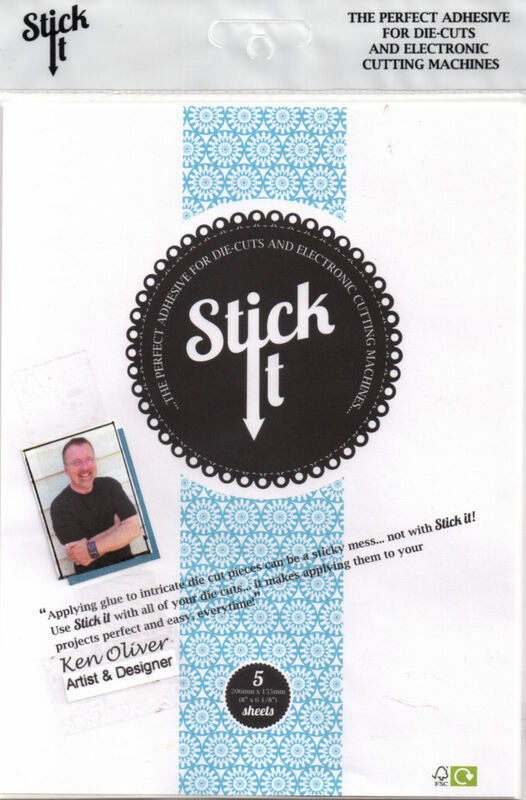 I was super honored to be asked because I know thousands of viewers read their blog every day to mixed media inspiration! And, some of the best artists around post amazing art there all the time! This month's challenge is "Butterflies and Blooms." It's spring and I couldn't wait to get started. But, I wanted to do something a little different for this challenge. 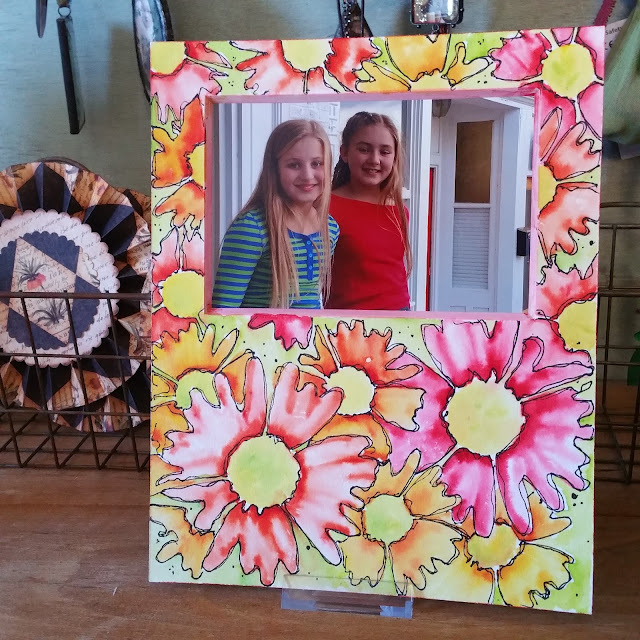 I created an 8"x10" photo frame using one of my Mixed Media Photo Mats. The mats are really great, they're heavy weight mat board that holds up to water media without warping. The front of the mat board is covered with smooth watercolor paper, so it's great for watercolor, or coloring with your favorite coloring medium, whether it's markers, colored pencils or inks. 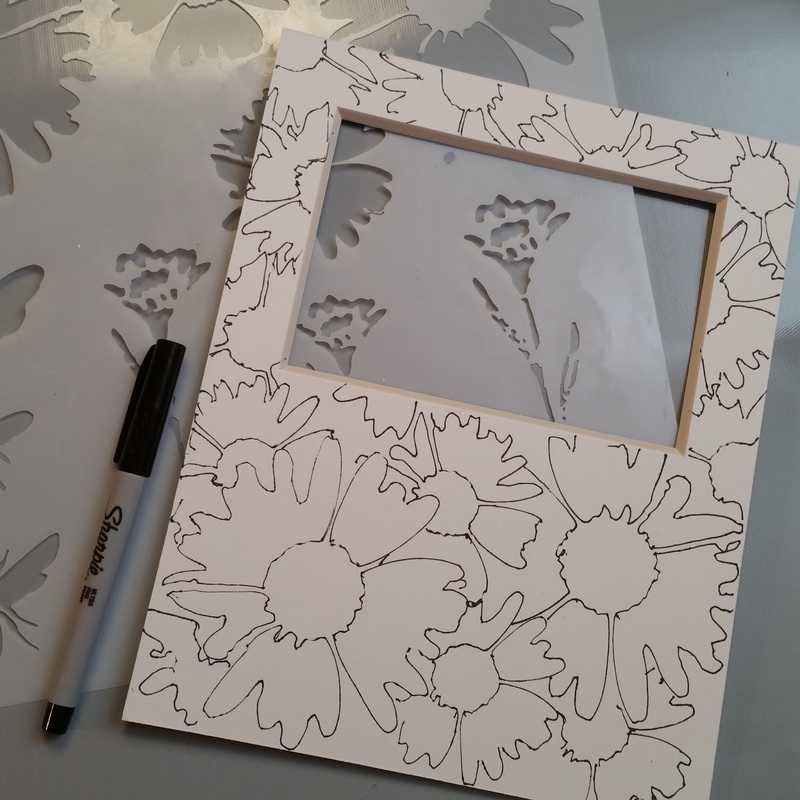 And since "coloring" is so popular, I wanted to show you how you can create your own coloring pages or projects using stencils that you may already own. 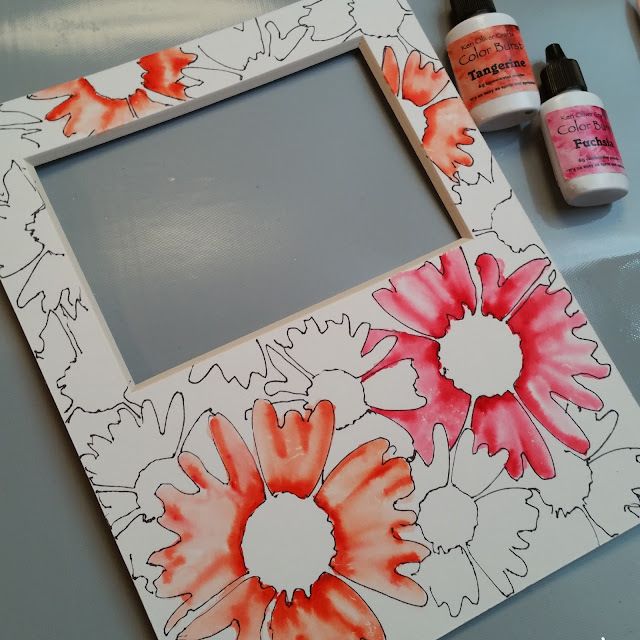 I simply used a stencil from The Crafter's Workshop to create a back ground design by tracing the shapes of the stencil with a sharpie onto my mixed media board. I layered traced shapes on top of one another making sure to keep in mind which traced flowers were foreground, mid and background. It gives the illusion of depth of field in the composition. Here's a tip when using stencils for a background pattern like this, rotate or angle the stencil in different directions as you trace the image. It appears that the flowers are all different, just by changing their angle or position. When I'd completed tracing my background, all I had to do was "color" each image with Color Burst, a brush and water. As you're coloring with Color Burst, there's no need to stay in the lines perfectly. Afterwards, you can go back with a sharpie to redraw the lines a bit. It looks pretty cool...and watercolory! I gotta tell you, I love coloring with Color Burst, because it's a powder, you can get really intense colors and blending with a brush and water lets you get very interesting shading and highlights. 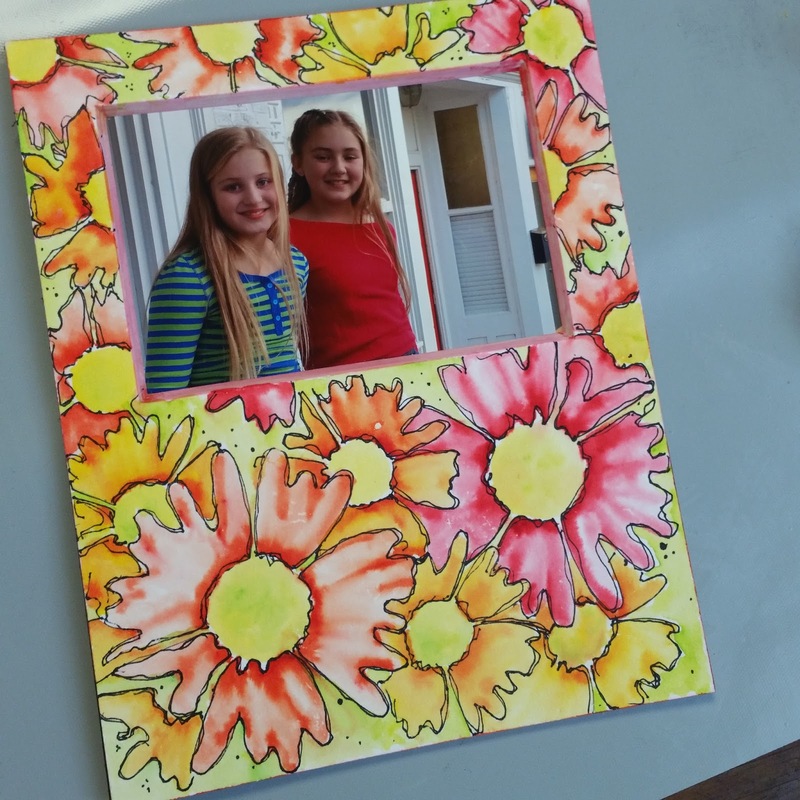 I painted the flowers with Fuchsia, Tangerine and Lemon Yellow. When I'd colored all the flowers, I used a light wash of Chartreuse to fill in the background. When everything was colored, I went back to the surface with a fine tipped Sharpie to redraw the flowers for added visual interest. I finished the surface with a waxing medium to protect the watercolor. 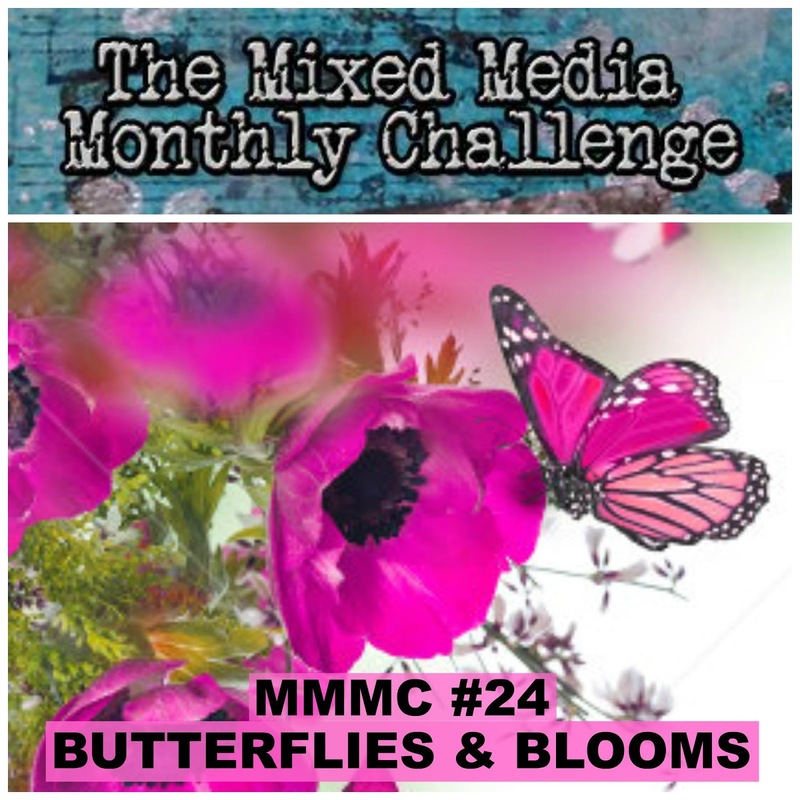 Now, you have to check out the projects over at The Mixed Media Monthly Challenge! The mixed media art on the blog is incredible! And, take the challenge to create a mixed media piece! It's always good to challenge your self to create something new. When you take the challenge and post it...you'll have the chance to win a set of Color Burst Caribbean Brights! Make sure to read the rules and requirements for eligibility...I am telling you, you will love the art you'll find there! Thank you for visiting my blog today and make sure to take the challenge at The Mixed Media Monthly Challenge! Ken, this turned out so wonderfully. Love the colors and the added lines give it so much more depth? Can you share which wax medium you like the best? Just instructing the preschools with exhausting letters in order may have kids coloring pages negative effect on them.